Kashmir’s famed fossil heritage site at Guryul is facing a fresh threat from “illegal stone quarries”, sparking fears that remains from the pre-dinosaur Permian period are being sold as raw materials to feed the Valley’s booming construction business. The quarrying at the site, 18km from Srinagar, had stopped after an outcry by leading geologists from the country and abroad following a report by The Telegraph in 2008. G.M. 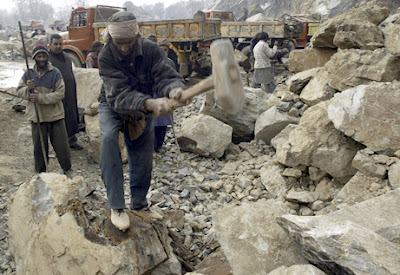 Bhat, who heads the geology department at Jammu University, has now written to the Jammu and Kashmir government that stone quarrying has resumed at the site, posing a fresh danger to the remains that date back over 250 million years. “The undersigned, along with MSc students and research scholars of Jammu University, was on a geological field trip to Guryul ravine and adjacent areas from 5-9 April 2012. We found illegal mining was going on and eight new quarries have been started within the prohibited area which needs to be stopped immediately,” Bhat wrote in the letter to the state’s geology department. Bhat said illegal mining at Guryul, declared a protected site in 2007, had stopped in 2008-09 after geoscientists from India and abroad brought the matter to the notice of Prime Minister Manmohan Singh and chief minister Omar Abdullah. “We found dozens of quarries operating there but eight of them are inside the area that has been demarcated for the heritage site. There is a real possibility that priceless fossils embedded in rocks are being lifted in trucks and sold as stone chips for cement factories or housing construction,” Bhat said. The mineral officer for Kashmir, Abdul Majeed Mir, said he had received no reports of any illegal mining at Guryul. “Any extraction is banned at the site as it is a protected site of international importance. Our department shares the responsibility of protecting the site along with other agencies like police. But, yes, our department has weak manpower so extraction may be taking place during odd hours. We, however, have no report that it is indeed taking place,” he said. The site, he said, has been known to geologists across the world since 1868 and has attracted leading geoscientists in their search to know the causes of the “mother of mass extinctions” — the Permian-Triassic extinction —about 252 million years ago, which wiped out 95 per cent of marine life and most land species. “Thousands of fossil species are embedded in limestone in the Guryul ravine at Zewan. The global extinction event is recorded in several parts of the world like Iran and China but with ‘partial’ preservation. The Kashmir section exposed in the Guryul ravine is completely preserved,” the Jammu University geology head said. Despite the massive summer unrest that roiled the Valley from 2008 to 2010, the site attracted teams from Canada, Taiwan, Italy and London. “We expect a Swiss team next month and it will be a great embarrassment if they witness this wanton destruction of such an important site,” Bhat said.